This whole blog entry was prompted prompted by a wonderful little thread on Woodnet. Also I get enough questions about combo filing our sash saws that I figured I should just post something. 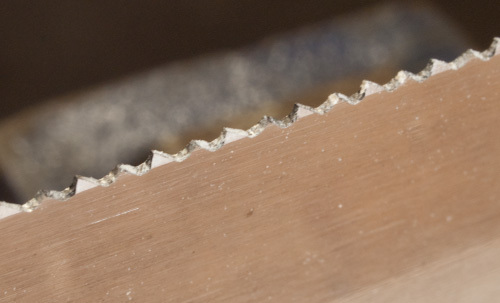 Q: The combo filing on the sash saw means one saw can both crosscut really well and rip cut really well. How come this filing isn't more popular? A: My guess is the reason why the basic combo filing (which is really a fairly aggressive rip saw with a little fleam for cutting hardwood) isn't more popular is twofold. In the professional world of hand sawing most hand saws were used in construction and, since the 1840's at least, were mostly used for cross-cutting softwood. Ripping was done far less frequently. A saw tuned for cross cutting softwood is a lot more useful and will work faster for that type of work than one for hardwood. The second reason is that it's a really tricky filing. I don't think a regular machine filed saw would work nearly as well (cutting smooth and fast in both rip and cross-cut modes) as a properly hand filed saw. It also turns out that even by hand the combo sharpening requires lots of skill and has a far smaller window of success. So my historical guess is that most attempts at filing combo weren't consistently done well enough to merit specific documentation. That being said, from historical documents we can pretty much tell you that most 18th and early 19th century saws were used interchangeably for rip and crosscutting and it wasn't until the mid 19th century that so much negative rake and fleam was added for cutting softwood that a separate saw was needed for ripping. Q: Why we don't offer a dovetail saw in a combo filing? A: The reason for that is that our current 19 ppi rip dovetail saw is a lot finer in pitch than most of our competition, still cuts very fast in rip mode (even compared to thinner blade saws) and it works pretty darn good at crosscutting hardwood too. With our saw you don't need more pronounced fleam to to do a good job crosscutting small shoulders. And as it turned out with testing, with that fine pitch adding more fleam to such tiny teeth doesn't automatically improve the overall preformace of the saw. So my answer is that the saw works for ripping optimally as is, and for crosscutting pretty well, so why confuse the waters? If we did produce a courser saw at that size, it would combo file better. but you would lose some ripping ability and be harder to start. One other point: since we file by hand there always is a tiny bit of inconsistency that you just don't get with a machine filing. For example as the filer works on dovetails saws (which are fairly short), they don't imperceptibly slide in their seat for each tooth, consequently the fleam angle might change ever so slightly as they proceed. The result is that finished saw will work a tad smoother than if they did, or if they used a filed guide for each tooth. It's just one of those things. A couple of comments on the photo. It's a picture of just the teeth of my personal sash saw which is a few years old. You can clearly see the very consistent dent on the side of ever other tooth from the setting. Note that the bend only goes as far as the tooth - not further, there is no ripple effect in the saw plate (and there should not be). The other teeth without the set marks are bent towards the camera so they look foreshortened. That, and what looks like very shallow gullets is largely an optical illusion caused by the teeth all bent towards and away from the camera position. You can't really see the cutting edges very well in the photo. The toe of the saw is off the screen at left. If you no idea what I am talking about with fleam and rake. Click here- for our handy dandy saw guide that we published a few years ago. I've had my Sash saw for about a year, and once the burrs got worn off, it is one of the sweetest and fast cutting saws I've ever used. Also it has a lower hang angle then many saws, which helps with starting the saw, especially when crosscutting. If you get one, just use it for ripping for a while, until it starts cutting smoother. Then, especially when crosscutting, start the saw while "floating" it. You'll be amazed how well it works.